Creationists develop models like these by studying the facts of God’s Word and God’s world. After the Flood, Noah stepped into a forbidding world. The animals and plants from the previous world were dead and buried under thousands of feet of sand and mud. New plants were struggling to reestablish themselves across the barren expanse of earth. Meanwhile, the earth remained unstable. Its bell had been rung, and it would take centuries to quiet down. 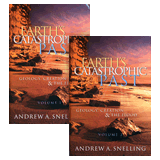 Supervolcanoes belched ash and death over vast regions, and superquakes rocked the earth. Somehow, the earth’s climate had to transition from the warmest, wettest period in history, to the moderate weather we expect today. But it was a rocky transition. The volcanic activity during the Flood had left the oceans very warm—on average 86°F (30°C), in contrast to 39°F (4°C) today. Warm oceans next to cold, barren continents was a recipe for violent storms. In the years after the Flood, “hypercanes,” similar to Jupiter’s Great Red Spot, persisted for decades. These storms drew water from the oceans and rapidly dumped it onto the land. The water quickly filled the depressions in the continents, and these temporary lakes burst through their barriers, cutting deep canyons in their wake. The intense rains saturated the newly laid sediments, allowing groundwater to blast miles of caves in days. As the oceans cooled, precipitation declined, and many of the world’s forests dried and converted to grasslands. 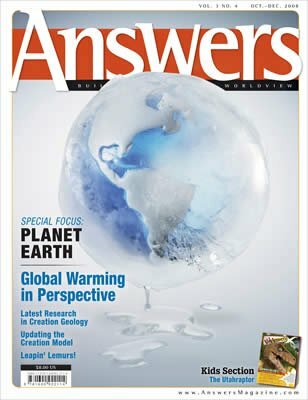 When the earth had cooled sufficiently, precipitation began to fall as snow and ice, especially in the world’s mountain ranges, Antarctica, and northeastern North America. The ice built up rapidly, sometimes miles thick. In North America this ice eventually surged under its own weight, spreading out and scraping the earth’s surface, and then it melted suddenly. As the ocean-cooling hypercanes dissipated, the pattern of air circulation changed for the entire planet. With this shift, deserts formed in belts around the world, about 30 degrees north and south of the equator. As the animals left the Ark, they rapidly multiplied and spread over the earth. Within just a few years, animals had reached every continent, including Antarctica, which was still warm. Many animals, such as tortoises, traveled on huge mats of floating logs that circled the earth’s oceans for centuries following the Flood. 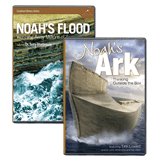 God preserved every kind of land animal and bird on Noah’s Ark. Descendants of the original pairs ended up on different continents, thousands of miles apart. Even today, these diverse descendants can still breed with each other. For example, the descendants of the first cats can still breed—cougars with leopards, lions with tigers, and wild cats with domestic cats. Each kind of plant and animal had the capacity to produce offspring with different designs to suit them for different environments. We see this same capacity in modern dog breeds, such as Alaskan malamutes that can sled at the poles while Persian greyhounds can hunt in the hot deserts. None of that variety was put there by humans. The information was there, all there, right from the start. As life refilled the earth after the Flood, continuing catastrophes buried snapshots of the fleeting environments that rose and fell. The fossil record shows some of the striking variety among the descendants of the animals that left Noah’s Ark. For instance, we find fossils of more than 150 different species that arose within two centuries after the first horses left Noah’s Ark. Modern descendants of the first horses include zebras, donkeys, and stallions. These fossils remind us of the wisdom of the Creator, who programmed a way for complex ecosystems to be reconstructed worldwide in a very short time after the Flood.